After the assassination of its first leader al-Khal in mid-November 2015, the pro-Islamic State (IS) Liwa Shuhada' al-Yarmouk (Yarmouk Martyrs Brigade) based in southwest Deraa province along the border with the Golan Heights appointed Abu Obeida Qahtan as new leader. Qahtan, of Palestinian Syrian origin, is a jihadi veteran and apparently among the founders of Liwa Shuhada' al-Yarmouk. His presence in the group is also rather exceptional in that he is originally from the Yarmouk camp in Damascus, not a native of the Yarmouk Valley/Basin (Wadi/Hawdh al-Yarmouk) where Liwa Shuhada' al-Yarmouk is based and draws most of its manpower. In this context, two important local clans are the landowning Baridis, from which al-Khal came, and the Ja'ounis, from which his deputy Abu Abdullah al-Ja'ouni (also killed in mid-November 2015 alongside al-Khal) came. According to a Ja'ouni from the Hawdh al-Yarmouk locality of Shajra that is controlled by Liwa Shuhada' al-Yarmouk, the Ja'ounis are Palestinian in origin but have long been present in Shajra. As for foreign members (muhajireen), the only known case until now has been an Israeli Arab who paraglided into Liwa Shuhada' al-Yarmouk territory from the Golan Heights in October 2015, clearly with a prior exceptional agreement from al-Khal, who otherwise rejected muhajireen. "In a step that was surprising to many observers, Liwa Shuhada' al-Yarmouk has announced the appointment of a new amir for the brigade who is the Saudi 'Abu Abdullah al-Madani' succeeding the prior amir for the brigade: Abu Obeida al-Qahtani [sic: Abu Obeida Qahtan]. Activists of the area controlled by the brigade affirmed the issuing of an internal decision that was not announced through the brigade's media in this specific case. The previous amir had received his position months ago following the killing of a number of the leaders of the first set [leadership council] in Liwa Shuhada' al-Yarmouk in an explosion on 15 November last year, at the head of whom was al-Khal, the amir at that time." On the same day (8 March), a Twitter account in Liwa Shuhada' al-Yarmouk's name put out a statement announcing the appointment of Abu Abdullah al-Madani as leader. A Telegram account and a Facebook account in the group's name have also put out this statement today (see here and here for screenshots). 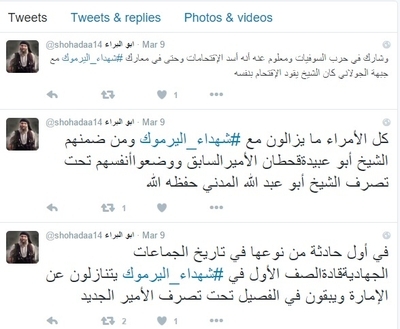 The statement is dated 7 March and follows almost the same wording as the statement that was put out by Liwa Shuhada' al-Yarmouk announcing the appointment of Abu Obeida Qahtan after al-Khal's death. The authenticity of the statement is not in dispute. Shuhada' al-Yarmouk announces allegiance to the brother Abu Abdullah al-Madani, as amir for Shuhada' al-Yarmouk. We ask God to guide his opinion and fill his path with light, as well as asking God to bestow on him, the leadership and members of Shuhada' al-Yarmouk steadfastness and the proper way. General Leadership for Shuhada' al-Yarmouk. Media Office for Shuhada' al-Yarmouk." This surprise appointment gives rise to some obvious questions. Where did Abu Abdullah al-Madani come from? What is the reason for his appointment? After all, prior to this point there has no been no evidence of the existence of such a person in the ranks of the group. Based on what I have written previously with regards to Liwa Shuhada' al-Yarmouk and foreign members, the earliest one can suppose that this man joined the group was after al-Khal's death, which gives him a timeframe of nearly 4 months to have risen to the position of leader. Such a rise would be very implausible if he simply came out of nowhere. The actual explanation for this move is that it appears to have come directly from IS. Indeed, one source in the Liwa Shuhada' al-Yarmouk circles, calling himself Abu Ammar al-Ansari, put it to me as follows, "All brothers are one and the order came from the Amir al-Mu'mineen [Commander of the Faithful: i.e. IS leader and proclaimed Caliph Abu Bakr al-Baghdadi]." In addition, the Baridi who was close to al-Khal- cited in my report on the life of al-Khal- explained that "the killing of al-Khal is the reason for his appointment. Abu Obeida Qahtan asked the wali [of IS' Wilayat Dimashq/Damascus province] to appoint a new wali [for Shuhada' al-Yarmouk]." The latter testimony does not necessarily exclude a role for Baghdadi in this leadership shift, as one can suppose consultation between the Damascus province wali [provincial governor] and Baghdadi on this matter. Therefore, the appointment of Abu Abdullah al-Madani as leader appears to be the strongest evidence yet of links between Liwa Shuhada' al-Yarmouk and IS. Though members and supporters routinely engage in pro-IS discourse, the group itself officially denies allegiance to IS, referring to it in one statement as Jama'at al-Dawla ('the state group [/group of the state]'), ostensibly denying IS' claim to be a state, let alone the Caliphate. Even the group's new statement on the appointment of Abu Abdullah al-Madani as leader implicitly reflects the official denial of allegiance, as it is stipulated that allegiance is owed to Abu Abdullah al-Madani as the amir of the group, not higher up to the Caliph Baghdadi, for no mention is made of Baghdadi or IS in the statement. In my own experience as of now, Abu Abdullah al-Madani is not the only case of an IS-Liwa Shuhada' al-Yarmouk relationship. In an earlier blog post I mentioned an IS fighter in the Damascus area with regards to IS fighter salaries. It is important to clarify, based on my subsequent conversations with him, what is presently meant here by the Damascus area. 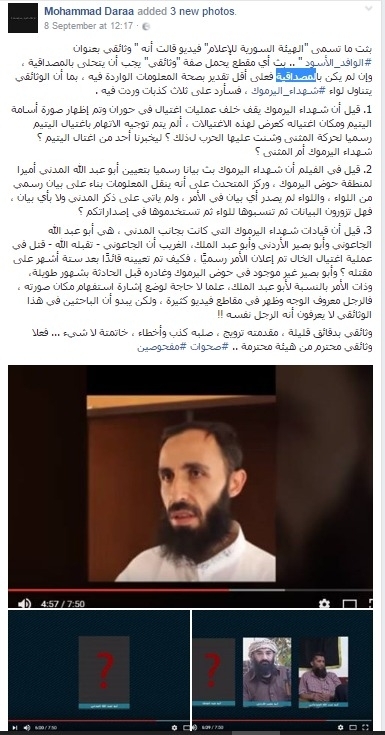 The person in question is originally from Nafi'a in the Yarmouk Valley and is of the Baridi clan (calling himself Abu al-Waleed al-Baridi), but by his own admission, his allegiance is to IS and his salary is from IS. However, Abu al-Waleed al-Baridi works within the ranks of Liwa Shuhada' al-Yarmouk: "I was sent from the Dawla [IS] to join the brigade, because it is no longer possible for me to return or go to the Dawla's areas [i.e. because of the siege imposed by Jabhat al-Nusra/southern Jaysh al-Fatah since 2015]. And I joined the brigade from the beginning of the fighting here [with Jabhat al-Nusra et al.]." During his tenure, besides military fighting in which he has been wounded, he has also served as the deputy amir of Liwa Shuhada' al-Yarmouk's Diwan al-Hisba, one of a few Diwans set up by the group in imitation of IS administration as part of the 'reform' program in 2015. Explaining the recent shift in leadership, Abu al-Waleed al-Baridi commented: "Because he [Abu Obeida Qahtan] is not successful in administration, and does not know anything about the requirements of administration, but rather he is among the elite of the fighters on the frontlines." It therefore seems that IS has intervened to appoint a new amir for the group because of problems under Abu Obeida Qahtan's leadership and fractures within the ranks. That said, the source did not profess to know whether Abu Abdullah al-Madani was sent by IS' wali of Damascus province, as he is currently wounded and has not spoken with the new amir yet. In all, the latest developments give more credence to the assessment of Liwa Shuhada' al-Yarmouk as an IS front group, which is probably being encouraged by IS itself to deny links for reasons of expediency. Indeed, Abu al-Waleed al-Baridi confirms this explanation in that a significant obstacle to an open declaration of allegiance remains the lack of contiguity between IS territory and Liwa Shuhada' al-Yarmouk territory: "It [IS] will not announce its presence in Deraa until it achieves total control of Deraa. It has soldiers in every area...If they [Liwa Shuhada' al-Yarmouk] announce [allegiance] now, they will be finished and there will not arise a structure for the Dawla after that point." Finally, instead of thinking of Liwa Shuhada' al-Yarmouk as a potential Wilayat Deraa as I have pondered in the past, it perhaps makes more sense to think of a future allegiance declaration, if it ever happens, as simply being an extension of Wilayat Dimashq. Indeed, prior official IS messaging directed at the Deraa and Quneitra areas has been via the Wilayat Dimashq media office. "In the first event of its kind in the history of the jihadi groups, the leaders of the first set [leadership council] in Shuhada' al-Yarmouk are relinquishing the amir position and remaining in the faction under the disposal of the new amir. All the amirs are still with Shuhada' al-Yarmouk including Sheikh Abu Obeida Qahtan the prior amir and they have placed themselves under Sheikh Abu Abdullah al-Madani's disposal (may God protect him). He [not specified in the original, but most likely referring to Abu Obeida Qahtan] participated in the Soviets war [Afghan jihad in the 1980s] and it is well known about him that he is a lion of assaults and even in Shuhada' al-Yarmouk's battles with the Jowlani front [Jabhat al-Nusra] the Sheikh has been leading the assault by himself." Even so, as the testimony mentioned earlier on Qahtan's administrative skills makes clear, something was certainly amiss in the group's ranks for a surprise appointment of a new amir to occur: an intervention by IS, so to speak, to sort things out. Note also that these tweets reflect the official line of denial of allegiance to IS, in speaking of "the jihadi groups" and "the faction." (Update: 17 September 2016): It would appear that the authenticity of the statement issued in Liwa Shuhada' al-Yarmouk's name regarding the appointment of Abu Abdullah al-Madani is disputed/denied, contrary to what I wrote in the original post. In the screenshot I took of a Facebook page in the group's name that put out the purported statement on 14 March 2016, an account by the name of Keeath Alaslaam denies that the statement is real. The account claims to be from the group's media office. "The so-called 'Syrian Media Commission' broadcast a video saying that it is a 'documentary by the title of al-Wafid al-Aswad.' The broadcasting of any segment bearing the attribution of 'documentary' must be endowed with credibility. If it does not have credibility, the information that appears in it should at least be correct. In so far as the documentary touches on Liwa Shuhada' al-Yarmouk, I will respond to three falsehoods that appear in it. 1. It was said that Liwa Shuhada' al-Yarmouk is behind the assassination operations in Hawran, and a photo of Osama al-Yatim and the place of his assassination were shown as a showcase for these assassinations. Was not the accusation of the assassination of al-Yatim officially directed at Harakat al-Muthanna, and thus war was launched against it? May someone inform us who assassinated al-Yatim? Shuhada' al-Yarmouk or Muthanna? 2. It was said in the film that Shuhada' al-Yarmouk put out an official statement on the appointment of Abu Abdullah al-Madani as amir for the Hawdh al-Yarmouk area. And the narrator emphasized that he is transmitting information according to an official statement from the brigade. But the brigade did not issue any statement on the matter, and did not make mention of Madani, and not in any statement. So are you forging statements, attributing them to the brigade and then using them in your releases? 3. It was said that the leaders of Shuhada' al-Yarmouk that were alongside al-Madani were Abu Abdullah al-Ja'ouni, Abu Basir al-Urduni and Abu Abd al-Malek. The strange thing is that al-Ja'ouni- may God accept him- was killed in the operation that assassinated al-Khal and the matter was officially announced, so how could he have been appointed a leader six months after his killing? And Abu Basir is not present in Hawdh al-Yarmouk and he departed it many months before the event, and the same with regards to Abu Abd al-Malek. Let it be known that there is no need to a place a question mark over the place of his photo, for the man's face is well-known and he appeared in many video segments, but it appears that the researchers for this documentary do not know that he is the same man! A documentary of a few minutes, whose opening is marketing, middle lies and errors, and end nothing. Indeed a respected documentary from a respected commission. Sahwat scrutizined." a) There has been an ongoing trend whereby fake and unofficial channels in the name of Shuhada' al-Yarmouk and the successor organization Jaysh Khalid ibn al-Waleed have put out information that is correct. b) The issue of the departure of individuals from Hawdh al-Yarmouk goes two ways: either they flee, or they head to formal Islamic State territory. c) Presumably a typo, the account appears to make an error in chronology in correcting the record. Abu Abdullah al-Ja'ouni was killed in November 2015, while al-Madani was appointed in March 2016, so the time difference is around 4 months.